An artist’s conception of how the Charitable Arch will look spanning Grand Avenue & Centre City Parkway, framing Bottle Peak to the east. 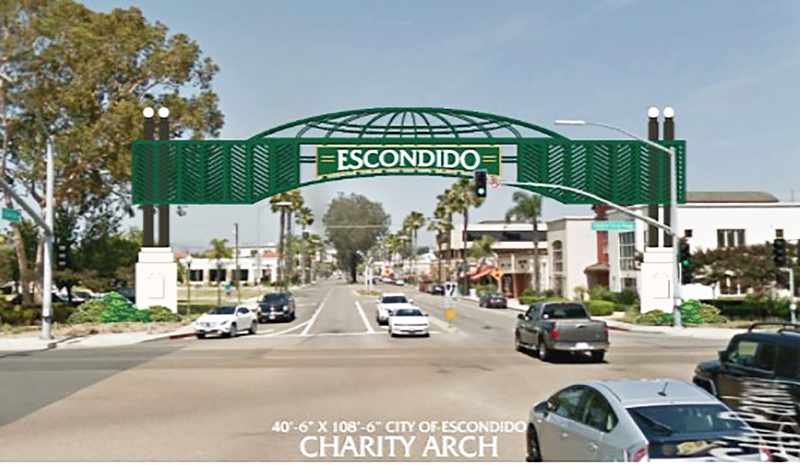 Someday soon Grand Avenue will have a new gateway, courtesy of the Escondido Charitable Foundation and an anonymous donor. The lighted arch will celebrate the spirit of charitable giving in the Hidden Valley and provide an opportunity to acknowledge donors by having places on the monument to place plaques. The arch, which will be 40 feet high and 180 ft. wide, was presented to the City by an anonymous donor. It will span Grand Avenue at the intersection with Centre City Parkway and will, when the observer is facing east, frame Bottle Peak as the city planners more than a century ago intended when they surveyed and laid out the street. The arch’s design harkens to the award-winning design of Escondido City Hall and the California Center for the Arts, Escondido, with filigree that suggests the city hall rotunda. Representatives of the Escondido Charitable Foundation spoke to the city council at its January 16 meeting to give background on the proposed arch and the work of the Charitable Foundation. The first speaker was Kenneth H. Lounsbery, a past president and one of the founders of the ECF. He pointed out many members of the foundation in the audience, including the man he described as the “point of ignition” for the ECF, Jack Raymond. “He still fuels the foundation system,” he said. The foundation, he said, has 160 donation partners. All contribute their own money to projects the foundation funds. “Thirty board members cover every area of life. All put their own portfolios with the ECF,” said Lounsbery. In the 12 years the foundation has existed it has made $2.1 million in grants and raised $1 million for an endowment. It has funded 82 grants. Lounsbery said the foundation contributes to “an extremely broad spectrum of charities. The next speaker was Ceci Lusky, this year’s grants committee chairman. The committee has 45 members. She described how each year it recommends a category for projects, and this is passed on to the board. The board interviews key people in the community to assess the best charitable needs. Last year the ECF chose as its category “Community Enhancement,” and chose to focus on that for two years, instead of one. This year they had dozens of applications. They were pared down to eight and committee members conducted site visits. Eventually they selected six. They included San Diego Youth Orchestra’s “The Allegro Project;” Escondido Arts Partnership, “local mural and flag project;” Escondido child development project, “The Wall Speaks,” a 9th Avenue mural; Escondido History Center, a restoration of the historic Victorian house and Pullman car; La Jolla Playhouse’s Excavating Escondido II, an interactive adventure in discovery; and Tierra Caliente Academy, Ticitozaa Folklorico Dance Festival. The ECF is now in its 2018 grant cycle, during which it will review 55 applications. Once the grants are awarded, the final step will be to check up on their progress in six months to ensure the money is being used as proposed. Returning to the podium, Lounsbery said his board knew last year it would be getting a donation of $1 million from an anonymous donor and began planning how to employ it. “The donation was attracted by the foundation’s history of reliable giving,” he said. The Foundation voted to commit to something long lasting that would both honor past givers and encourage future ones. The donation will be used to pay for the Grand Avenue Arch and “has the support of all the stakeholders,” he said. Many Grand Avenue meetings were held to inform business leaders about the proposed arch. 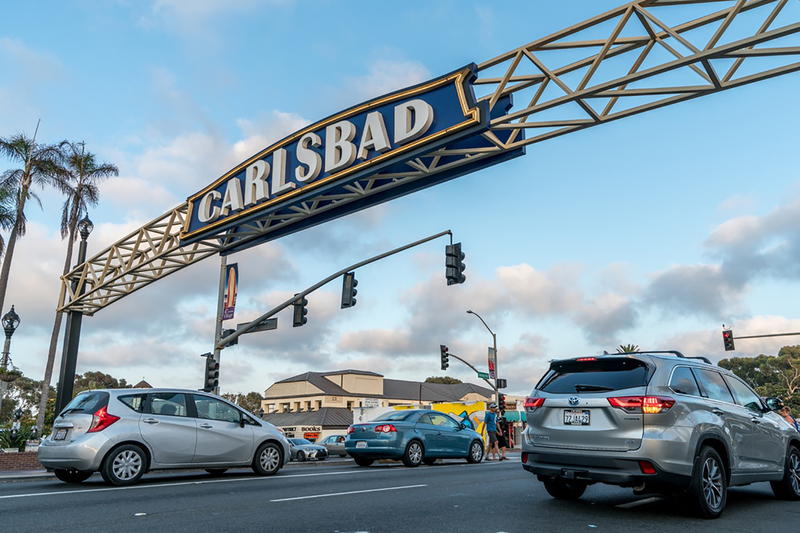 The ECF found a construction partner, Federal Heath, a company that specializes in building iconic signs, and which built the community gateway sign for the City of Carlsbad. ECF and company worked together on the design. “It will be something long lasting. A charitable arch to signify confidence in the community,” he said. The template for the design was the filigree of the Escondido City Hall, and was also intended to complement the Maple Street Square arch. Lounsbery said engineers tested the site at Centre City Parkway & Grand for stability. “The engineering takes all foreseeable stress into account,” he said. He noted that the arch would be fully lit on both sides with LEDs and will frame Bottle Peak looking east and the Mercado District looking west. It will have spaces on it for donor plaques to acknowledge future donors. Although a couple of council members were a little leery that the archway design wasn’t vetted ahead of time by a public review, there was a unanimous appreciation of the gift. Councilmember Olga Diaz said, “It’s beautiful,” and “very generous,” but suggested the project should be reviewed by the Arts Commission. “We should treat all projects with an equal degree of scrutiny,” she said. 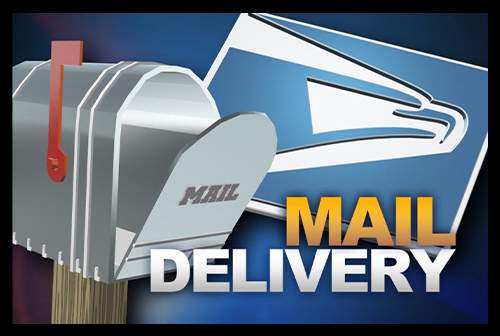 Martinez replied, “I think it’s important for public art to have a mechanism for public input.” She advised future donors to incorporate public input first and make a presentation to the arts commission before finalizing a design. Mayor Paul McNamara rounded out the comments. “It’s a beautiful project and it speaks well for our community. Edifices represent our commitment to our future. It represents that we believe in ourselves. It’s not just an arch but a symbol of who we are. The city manager assures me it will go through all the wickets to satisfy council members’ comments, but we can do it in as expeditious way so we don’t overspend the million bucks.